A computer virus is a software program that spreads (copies itself) from one computer to another computer and interferes with a computer's normal operation. It can corrupt or delete files and may attempt to spread itself to other computers via your electronic address book (which can really upset your friends and family). The bad behavior of these programs places them in a category known as “mal"ware rather than software. Did you know that 97% of all personal computer issues and malfunctions are related to virus software? Delaying its removal could lead to slower performance, simulated hardware problems, security issues (identity theft) and data loss. Don't worry! 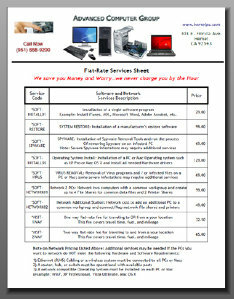 Here at Advanced Computer we can provide you with a free virus scan and a detailed printed report of any infections. So please, bring in your computer today for this free service!